The Donnelly Group has announced it will host a province wide pickup event in aid of Air Ambulance Northern Ireland and in partnership with the Young Farmers’ Clubs of Ulster. Taking place on Saturday, October 20th from 2pm and 6pm at the Speers farm on the Keady Road, Armagh, anyone with a pick up and a valid driving licence can buy tickets online now. Raymond Donnelly, director at Donnelly Group, said: “This is a really exciting event, and we’re delighted to have the support of the Young Farmers’ Clubs of Ulster as well as Grassmen. 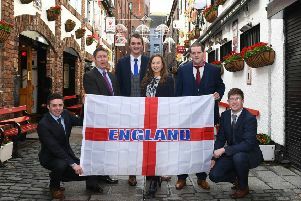 James Speers, president of Young Farmers’ Clubs of Ulster, said: “Young Farmers’ Clubs of Ulster is really glad to be on board with the Donnelly Group for what will be an unforgettable occasion. For more information and to buy tickets please visit www.donnellygroup.co.uk/roundup.